March was an interesting month for SJMC. The launch of the TRUE program has meant quite a few phone calls from potential clients and a lot of prep for the contracts that have already begun. 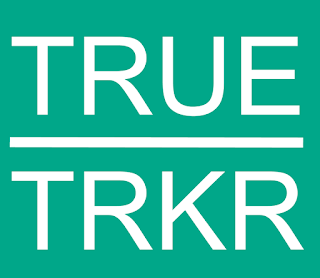 I received my TRUE Advisor designation and am very excited to get these projects going! I'm in the process of releasing an Excel based workbook to help companies track their flow of materials in relation to the TRUE certification credits. In addition I started working with Magna GC on some environmental compliance strategies. April's Zero Waste Business Review covers some recent food waste related research, packaging trends and some major partnerships in recycling tech just announced. If you have anything to be included in future ZWBRs, please reach out to me at sjmconsults (at) gmail.com. Eliminating waste is tricky business. Consumers continue to demand less of it (even produce maps to support it), businesses are faced with proving their claims for their entire processes and municipalities are caught in between without knowing or having much say about what actually comes their way. For that they look to the provinces. 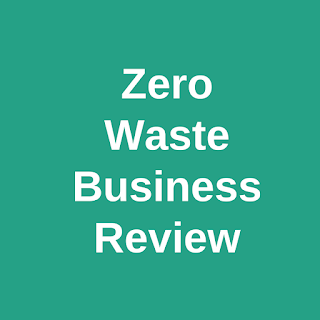 The National Zero Waste Council recently released “Packaging and the Circular Economy: A Case Study on Compostables in Canada” which found that only two Provinces, Ontario and Quebec, have any standards related to compostable food ware. Ontario's proposed Food and Organic Waste framework includes (Pages 50- 51) the proper identification and use of certified compostable food packaging, and a proposed organics in landfill ban for Southern Ontario. Quebec plans to ban organics from landfill in 2020-2022 with similar labelling guidelines. The report also concluded "The packaging industry did not fully appreciate the varying capabilities of composting manufacturing facilities across Canada. In fact, they expressed their surprise during the consultation roundtable" (pg 13). Geesh! It should be of no surprise that the Commission for Environmental Cooperation (CEC) recent research found that only 32% of organics in the US and Canada are diverted from landfill. The CEC recently made two reports on the issues available to the public. 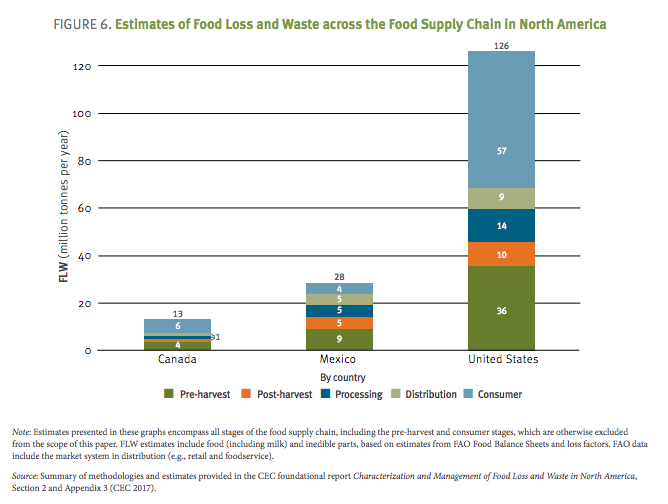 North America generates an estimated 265 million tonnes of organic waste each year. Of this amount, residents and businesses divert approximately 75 million tonnes (28.3%) through activities such as composting and anaerobic digestion, and otherwise dispose of approximately 190 million tonnes (71.7%) of organic waste in landfills. Canada and the United States both have an organic diversion rate of 32%, Mexico only 7%. The potential positive economic impacts of organic waste diversion are significant in terms of job creation potential and subsequent increase in GDP. For example, diverting 50 percent of the 141.5 million tonnes of organic waste (residential and ICI) disposed of in the United States in 2014 could generate an estimated US$7 billion in revenue and create over 160,000 jobs. Approximately 168 million tonnes of FLW are generated in North America each year. This estimate encompasses all stages of the food supply chain, including the pre-harvest and consumer stages. Per country, this equates to 13 million tonnes in Canada, 28 million tonnes in Mexico and 126 million tonnes in the United States. When excluding the pre-harvest and consumer stages, approximately 52 million tonnes of FLW are generated in North America each year. Per country, this estimate is equivalent to about 4 million tonnes in Canada, 15 million tonnes in Mexico and 33 million tonnes in the United States. 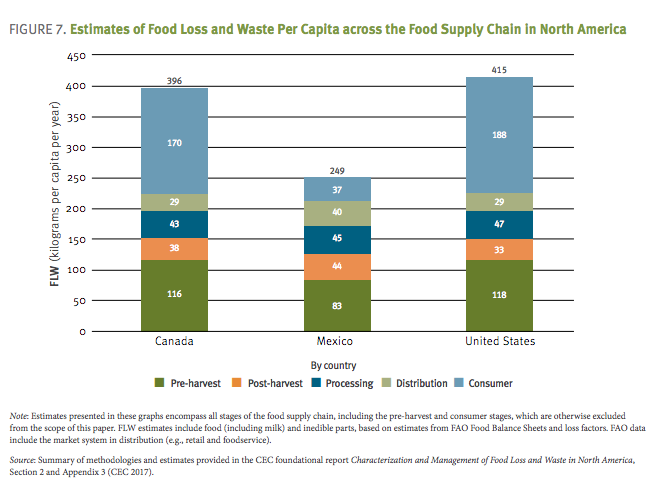 When including all stages of the food supply chain, per-capita FLW in Canada is comparable to that in the United States (396 kilograms/person/year and 415 kilograms/person/year, respectively). The per-capita FLW generation in Mexico is much lower—at 249 kilograms/person/year. Nevertheless, when excluding pre-harvest and consumer stages, rates across all three countries are comparable: 110 kilograms/person/year for Canada and the United States, and 129 kilograms/person/year in Mexico. 217 trillion kilocalories (kcal—1,000 calories) in potential energy lost. And as a shocker to me, was the per capita findings, yowzas! Of course it's not all doom and gloom, it is April, let's talk about the bloom! Ms Rose restaurant achieved South Carolina Aquariums 'Good Catch' program status. They achieved this status with a number of waste oriented projects including Smart Recycling, straw-less policy, and composting. Cocktail bars are embracing ZW principles in many creative ways - Vogue Magazine. Sparcs, Scraps spelled backwards, is a Zero Food Waste program that includes Tiffin containers, repurposed fabric as napkins, bread leftovers used to brew beer, etc. A PEI chef is dehydrating and rehydrating food to avoid producing waste. How Atlanta’s Ponce City Market Plans to Reduce Food Waste to Zero. Ocado Reduces Food Waste Through Redistribution Initiatives. Last month Dutch grocery store Ekoplaza launched their first plastic free aisle. It features 700 products, including rice, beans, yogurt, chocolate milk, cereal, snacks, and even meat. Recently a Petition has surfaced on Change.org that asks Kroger, America's largest grocery chain, to commit to a Plastic Free Aisle too. There are no signs of this happening yet as part of Krogers commitment to Zero Hunger : Zero Waste. The retailer to consumer plastic free movement is growing. When one leads, many will follow, and when five lead, who knows what will happen! It was announced just this month that 5 stores in the small town of Diss UK would become 100% plastic free. The unified effort shows that even competitors can cooperate towards a plastic waste free future. Retail giant Aldi announced it will be ditching single-use plastic bags as an effort to cut potential wastes to the environment. Furthermore they've committed to ensuring all packaging on its own-label products will be recyclable, reusable or compostable by 2022, as well as reducing operational food waste by 50 percent by 2030 (based on 2015 data). High Street chain Pret's CEO Clive Schlee, announced in a blog post that Pret would be adding a 10p deposit on all plastic bottles they sold. "The idea is that we would add 10p to all plastic bottles and return 10p for each Pret bottle given back to our teams to recycle. The aim is to understand how many bottles are returned and to see if it encourages more customers to opt for a reusable bottle. We will of course reinvest any unclaimed deposits in future sustainability work." This is a voluntary action to encourage the proper collection and recycling of plastic sold by Pret. Modular design concepts allow for the interchangeability of components, creating opportunity to update and upgrade certain elements without having to replace a whole unit. When adapted to B2B packaging this technique allows for containers to be reused, instead of previous cardboard options that were less compact and had to be recycled. Modular systems can also accommodate the sizing requirements better, which enables multiple units to be stacked within one housing, another advantage over cardboard. Orbis is well know for these features within packaging. Their products can be resized and to accommodate any number of configurations. To help brands in understanding these features and how they can accommodate the specifics of a brands needs, Orbis has announced the creation of their 4th OrbiShield Design Centre in Spartnaburg SC. This facility will assist brands located in the Southeast in understanding the benefits of the Orbis systems by having sales engineers, designers and sample makers all accessible in one location. Upping their game even further in the modular reusable packaging sector, Orbis has just aquired Response Packaging. Response Packaging specializes in highly engineered custom dunnage packaging for part protection. Response conceptualizes, designs, prototypes and manufactures reusable custom dunnage and fabricated steel rack solutions. Similar in concept, Itek has announced its first steps into incorporating this method into their Solar Panel distribution containers. Itek adopted the European-designed EckPack system which holds the solar panels in place while shipping and then disassembles to make the return of pallets and EckPacks easy and infrequent. Here's a EckPack promo video from 2014 for some insight into the basic premise of the design. Reusable packaging is seeing many applications, including B2C. Dry Cleaners have been on the forefront of environmental efficiency for years. 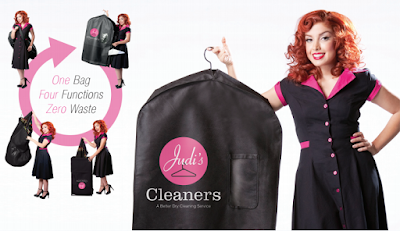 Providing less harmful chemical detergents, water and energy efficient options, recyclable or biodegradable covers and of course the infamous hanger return and reuse programs. There is another advancement on the brink of acceptance too though, reusable suit covers. It's become a trendy marketing opportunity to increase loyalty, advertise and cut their waste disposal costs. Unilever makes a lot of public commitments to the future of recyclability and circularity, and to back up that talk they recently walked into a deal with and innovative recycling technology start-up Ioniqa, and Indorama Ventures, the world's largest producer of PET resin. Here's a little more about the process from Ioniqa. It is unclear if the magnetic fluid itself is recyclable, which is a quality that would aid in the widespread adoption of this technology. Keep in mind this tech is still new and facilities to manage this process do not currently exist outside of laboratories and demos at 1000L capacity. An incredible piece by ArgoDesign that illustrates the potential innovations coming from Whole Foods and Amazon. Black Soldier Flies are being experimented with in Singapore as an alternative to composting. A crackdown on single-use disposable plastic packaging was a key point in the Chancellor of the Exchequer Philip Hammond’s 2018 Spring Statement. McDonald’s plans to reduce greenhouse gas emissions through improvements in recycling, packaging, lighting, equipment and agriculture. Ren Skincare commits to Zero Waste upstream and downstream. Ansfelden, Germany-based equipment maker Erema has reported a 100 percent sales increase in its most recent fiscal year for its Intarema K automatic processing and recycling system for plastic film edge trim. 3D Printed Houses produce Zero Waste. REI uses Yerdle to expand their garage sale program to go online. Typically the REI garage sale enables members to bring their preloved equipment in to be resold at their brick and mortal stores. REI joins Patagonia and Levis as Yerdle Commerce partners. Compology is a image-based sensor that lets you dispatch based on container fullness and contents to maximize your bottom line.